“A World Transformed: the Transcontinental Railroad and Utah,” shares the story of Utah’s contribution to the completion of the transcontinental railroad and examines the railway’s transformational effects on Utah. 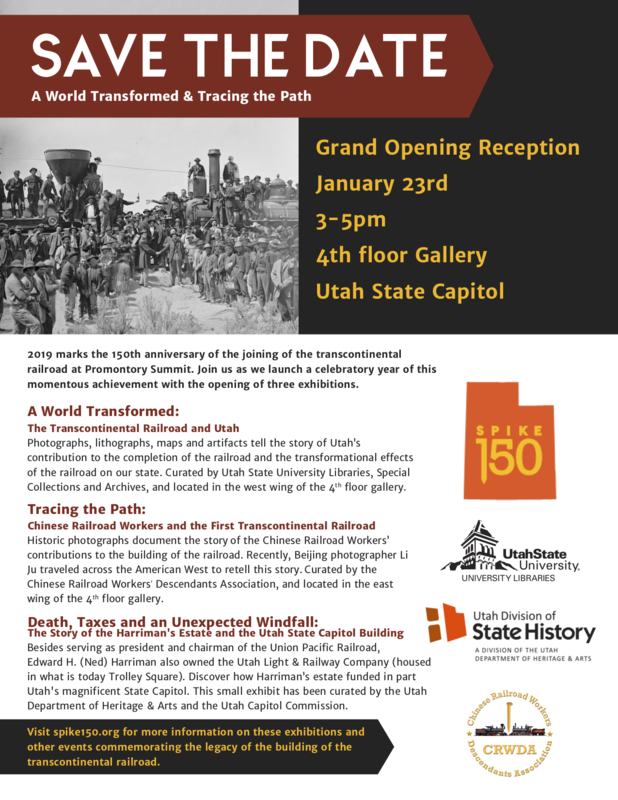 A partnership between Utah State University’s Merrill-Cazier Library and the Utah State Division of History, “A World Transformed” will travel the state of Utah from January 2019 through March of 2020. The exhibition draws upon the many rich historical resources held by different institutions across not only Utah but the Western United States, including photographs, maps, art, and lithographs. A condensed version of the exhibit is available for booking through the Utah Division of Arts & Museum’s Traveling Exhibits Program. An extended digital version will be available through USU University Libraries. For more information on exhibit dates and locations, see the Spike 150 website. This entry was posted on Thursday, December 6th, 2018 at 12:28 am and is filed under announcements. You can follow any responses to this entry through the RSS 2.0 feed. You can leave a response, or trackback from your own site.